The phytohormone abscisic acid (ABA) promotes plant water conservation by decreasing the apertures of stomatal pores in the epidermis through which water loss occurs. 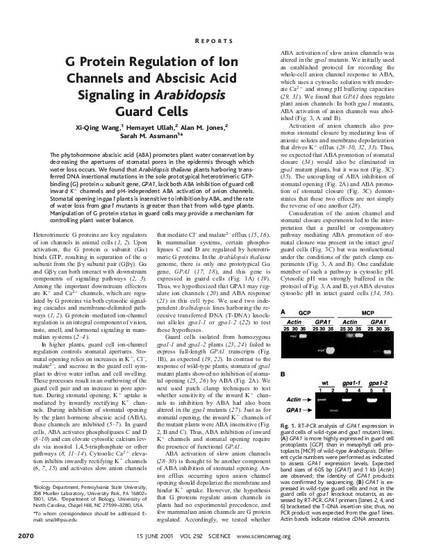 We found that Arabidopsis thaliana plants harboring transferred DNA insertional mutations in the sole prototypical heterotrimeric GTP-binding (G) protein alpha subunit gene, GPA1, lack both ABA inhibition of guard cell inward K(+) channels and pH-independent ABA activation of anion channels. Stomatal opening in gpa1 plants is insensitive to inhibition by ABA, and the rate of water loss from gpa1 mutants is greater than that from wild-type plants. Manipulation of G protein status in guard cells may provide a mechanism for controlling plant water balance.